This post is sponsored by Wellness® and the BlogPaws® Pet Influencer Network™. 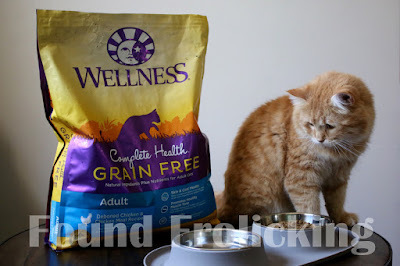 I am being compensated to help share the availability of Wellness Complete Health and NEW Complete Health Grain Free Cat Food available at PetSmart, but we only share information we feel is relevant to our readers. Neither Wellness or PetSmart is not responsible for the content of this article. Our animal companions rely on us for their food, the conditions of their living space, sources of entertainment---everything, when it comes down to it. Which is why I was aware the moment that my family took in Duke that it would be my responsibility to provide our family pet with a healthy, balanced diet. When it came to cat food, I knew finding a wholesome natural source of nutrition. I found a great variety of Wellness® natural pet food options at my local PetSmart. Wellness® Complete Health™ancestral grain-free and Carrageenan-free recipes are carefully formulated and optimized with vitamins and minerals for a hearty recipe that contains no fillers. You won't find any soy, corn, wheat, or artificial colors and flavors in these foods. Anyone familiar with cats know they've little in common with the beloved cartoon character, Garfield, who seems to often scarf food down even before he really know what it is. Cats can be picky, finicky eaters! 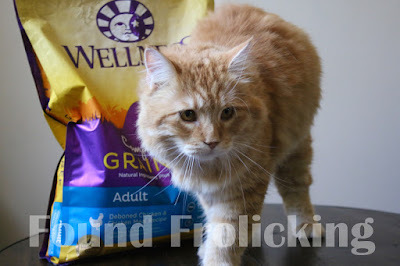 So unsure of what to expect, I held my breath when I picked up a bag of Wellness Complete Health grain-free dry food, and brought it home. But I needn't have worried. The Wellness grain-free Complete Health chicken-based formula was a smashing hit! In fact, Duke is so fond of his food staple that I've caught him trying to bite his way into the bag on many occasions. He never appeared very excited about mealtime prior, but since switching to Wellness I've noticed an uptick in enthusiasm. He will remind me it's mealtime if I'm even 10 minutes past the regular time, meowing at me insistently, and when it's clear I am going to oblige and feed him, he jumps up to his food dish eagerly (and impatiently, might I add). I have noticed an improvement in the condition of his fur as well, which seems more luscious and bushy than ever. I certainly hoped we would have good results with Duke's switch to the grain-free diet from Wellness, but the changes absolutely exceeded my expectations. 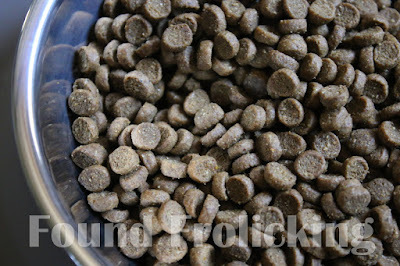 It has been wonderful to see that Duke has been enjoying and benefiting from the better nutrition available to him with his Wellness grain-free dry kibble. You can now recycle select Wellness products through Terracycle, a leader in upcycling and recycling. This partnership between Wellness and Terracycle was established to help eliminate waste as part of their dedication to long-term sustainability. The Terracycle program is open to individuals, schools, and organizations to give everyone the opportunity to make a difference. You simply ship any empty Wellness® Complete Health and Wellness® CORE dry food packages to Terracycle---for free. For doing your part to minimize waste, you will have to opportunity to earn gifts or cash for each pound of waste you send, or donate to your favorite school or nonprofit organization! Click here to sign up for the Terracycle program today. Celebrate the Year of the Cat with Wellness! After all, the felines in our lives deserve to be celebrated---and don't they know it. Look for the Wellness® Complete Health and Wellness® Complete Health grain-free dry and wet food options at your local PetSmart. This is a sponsored conversation written by me on behalf of Wellness®. The opinions and text are all mine. Disclosure: The opinions expressed above were in no way influenced by the brand or any other sources. The post and all photos with the watermark are the property of Found Frolicking, and should not be used or distributed in any way without first receiving permission. Find out how Found Frolicking can help promote YOUR business! If you would like to work with Found Frolicking for a review, giveaway, advertising, or promotion of any other nature, please email Lalia at found.frolicking@gmail.com. This is such good information on how to take care as well the health of our cats. This post is very informative and helpful for all cat lovers. I love that there are so many healthy foods for pets. This one sounds great. It makes me so happy that Wellness has long-term goals and current actions for environmental sustainability. This paired with the healthiness for pets, it sounds like a good product and company. That's great! I've found my kitty trying to chew through bags of food too. It's funny. This looks great and I love that it is grain-free. Duke is such a pretty kitty and yes Wellness does make a wonderful pet food! My cats loved it! I feed my kitties a grain-free formula too. I must try the Complete Health Grain Free Cat Food sometime. I often joke that my cat eats better than me. I haven't tried him on wellness yet, but this looks like a good, healthy food! This is great information on caring for cats. I will pass this along to my friends son who just got his first pet cat. We don't have a cat but the kids have been begging for us to get a cat. Your cat is so adorable! Our pets are such an important part of our family. It is just as important that they eat as healthy as we do! Thank you for providing so much info about the Wellness brand! I love the idea of recycling wellness products. It cuts down on wastefulness. This is so great. I will have to see if they have anything for dogs! I don't have a cat but I know some friends who does. It makes me so happy that there are so many new pet foods that focus on health!